Red salvia flowers can form a striking accent when massed together as bedding plants or lined up in a row as edging plants. They are also popular in container gardens, where they can serve as a vertical accent (surrounded, for example, with the lower-growing white sweet alyssum and/or silvery dusty miller). This long-time favorite will serve as a great addition to the yard in summer and early fall if you follow a few simple rules about locating and caring for it. Plant taxonomy classifies red salvia plants as Salvia splendens. Despite an official common name of "scarlet sage," many people refer to the plants simply as "red salvia." They are members of the mint family. 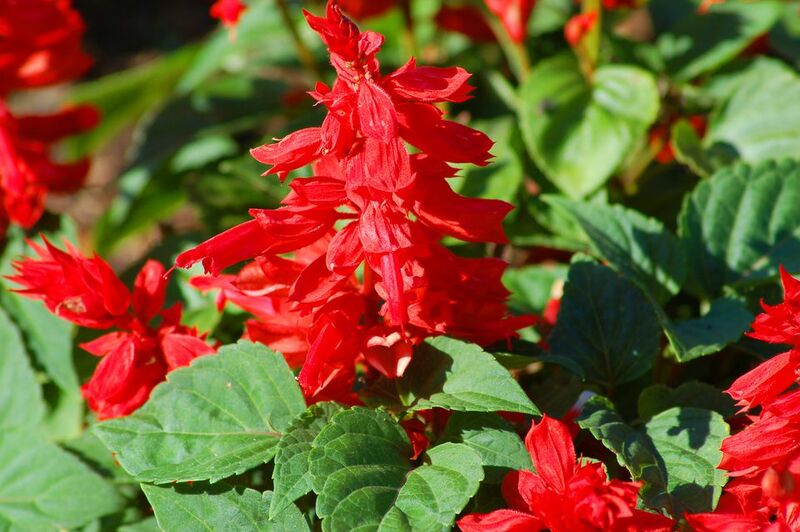 Indigenous to Brazil, where they grow as perennials due to the hot climate, red salvia flowers are treated as if they were annual plants in temperate zones: They are damaged by hard frosts and will not survive through cold winters. Although the scarlet varieties are the best known, Salvia splendens does come in other colors, including white, salmon, pink, purple, lavender, burgundy, and orange. Salvia splendens reaches 18 to 30 inches in height. Its flowers grow on spikes and are quite showy (thus its popularity). The dark-green, heart-shaped, 3-inch leaves give off a smell that mammalian pests dislike, making them both deer-resistant and rabbit-proof plants. Growing red salvia flowers in full sun will give you the biggest flower output. Also select a location with a loamy, well-drained soil. Amend the soil with compost. To improve their looks and encourage better flowering, deadhead red salvia plants. You can do this by pinching off the flower spikes with spent blooms. Make your pinch fairly far down on their stems. Be on the lookout for and take action against slugs, snails, and whitefly, all of which may bother red salvia plants. In fact, when shopping for plants at the garden center, carefully inspect the undersides of the leaves for whitefly right then and there, to avoid bringing any home with you. Whiteflies are notorious greenhouse pests, and, occasionally, they will make the trip from greenhouse to garden center, undiscovered. Most gardeners will fertilize the plants with the same balanced fertilizer that they use to fertilize their other annuals, often applying it with a hose-end sprayer while watering. Buy a hose-end sprayer from Amazon.com. Along with geraniums and impatiens, these annuals are perhaps the first flowers that come to mind for many folks when using annuals to inject a splash of red into the landscape. This makes them valued by those in the USA putting together red, white, and blue flower displays for the 4th of July holiday and for Memorial Day decorations. But because scarlet plays well with other colors used in autumn themes (especially yellow, such as yellow Chrysanthemum flowers), there is still a place for them as fall flowers once summer is over. For this reason, you should be pinching and deadheading them during the summer, so that, when early fall rolls around, they will still be in good enough shape to supply your landscape with vibrant color. Although "scarlet sage" is one of the common names for this plant, do not confuse the red salvia flowers that we have been discussing with Salvia officinalis. The latter is the culinary herb better known as "sage" and was also used medicinally going back to the Greeks and Romans (hence the genus name, which comes from the Latin for "save"). A more colorful version of this plant is the Tricolor sage. Another famous (or, depending on your point of view, infamous) relative is Salvia divinorum, which is a hallucinogenic drug. What is priceless to behold is when the beginning gardener who had previously grown only annuals discovers the fact that there are types of salvia that are hardy perennials in the North. The most popular kinds, however, have not red, but bluish or purplish flowers. An example is May Night salvia.